'Christian interfaith' is a phrase which has two uses. I refer to myself as christian interfaith. I am Christian because I follow Jesus, celebrate God within a Christian (catholic) service and find much inspiration in the Bible. I am interfaith because I recognise many paths to God. The other use of the phrase is for Christians who believe the only path to God is through Jesus, and yet actively seek a world in which they get along with their neighbours who may be of other faiths or none. There are interfaith groups which meet all over the UK such as my local Swindon interfaith group. Tolerance and cooperation are the requirements. There is no insistence on shared beliefs - though many are inevitably discovered along the way. This article is about the modern day Christian martyr, Bhatti. I don't know which definition he would relate to, but I suspect the former. On 2 March 2011 Shahbaz Bhatti, politician and Christian activist was shot and died. He was age 42. The article includes a catholic prayer for someone who has died. Because I had not heard of him and suspect that others have not done so either, I felt moved to celebrate him on this Christian Interfaith article, and share the inspiring and heartening news of his love of Christ and of his interfaith initiatives. 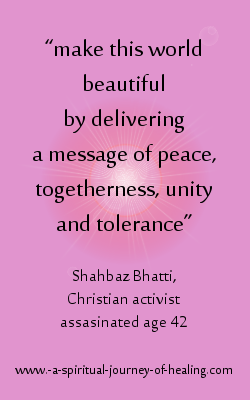 “make this world beautiful by delivering a message of peace, togetherness, unity and tolerance”. Many of us will relate to those words and aspire to carry out the same spiritual service. Born a Catholic, in his teens Bhatti experienced a spiritual awakening to which he credited his life’s work to serve others as he believed Christ had done for him. He founded the Christian Liberation Front (CLF) in 1985. The movement’s aim was to give rights to Pakistan’s religious minorities and promote interfaith tolerance. From the start, he received death threats. The current intolerance of minority religions in Pakistan (written in 2011) is all the sadder when one considers that Bhatti’s objectives were aligned with the vision of Pakistan’s founding father, Muhammad Ali Jinnah. This included pluralism, freedom of religion and the rule of law. a 24 hour minorities helpline. There was a global reaction to his death, indicating the respect with which Shahbaz Bhatti was regarded. So true. To embark on changing situations in which there seems little chance of change, we rely not on our strength, but on a strength we can draw on that is beyond us. We learn that God's strength is the only strength we have. We see here how many Muslim leaders within Pakistan want a country of peace and tolerance. They were prepared to engage in interfaith dialogue with Shahbaz Bhatti even though it might bring danger to themselves. I thank God for the courage of these Muslims. I hold a place for the people of Pakistan. May God continue to guide them and strengthen them. May he give them and us a revelation of the Love that sees us all as One. I celebrate the life of Shahbaz Bhatti and mark the passing of a life lived for God. Eternal Rest give unto him O Lord. We don't have to wait until we die to rest in the peace of God's love. I now say the prayer above for myself to rest in peace and for you to do the same. Peace is eternal and eternity includes now. Read about my journey from outside the church to calling myself a Christian once again. Move from this Christian Interfaith article to a full list of articles on the Spiritual Blog.